In this quarterly update webinar on February 27th, Uptime Institute Intelligence and technology executives discuss developments in the field of mission-critical digital infrastructure. Among the topics are hyperscale expansion, AWS’s Outpost, information security, and some big recent outages. 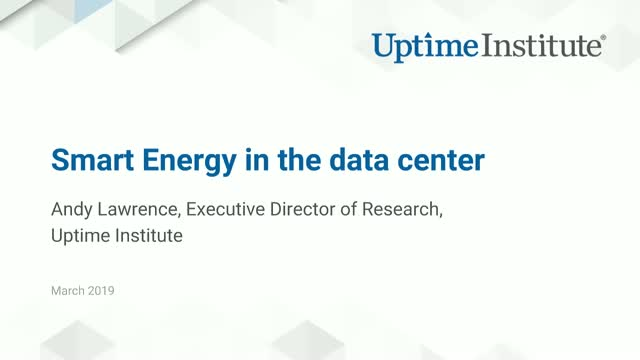 Members of Uptime Institute’s executive team discuss the newest findings about data center outages, including trends in causes and types, along with strategies for reducing the number and impact of outages. Join the Uptime Institute Research team on November 28th as they discuss recent developments and research findings spanning outages, innovation, new services, and industry news. This is the first of a quarterly series. Whether you are considering an expansion of existing facilities, consolidation of multiple data center sites, or an acquisition or divestiture of data center assets, this session will cover some key points to mitigate risk, identify the infrastructure and operational health of assets, management and operations, lifecycle considerations, and the overall resiliency of key data center assets. How do you ensure your data center staffing plan meets your business's performance and risk requirements? And at the same time, how do you keep growing and challenging your employees to retain key staff? Are you creating a successful culture of continuous improvement as well as a place your employees want to be? The 8th Annual Uptime Institute Data Center Survey provides an overview of the major trends shaping IT infrastructure and strategy. Are you on top of what's happening in the industry? Find out what 900 data center operators and IT practitioners worldwide had to say. How do you ensure your staffing plan meets your business's performance and risk requirements? Do you have an appropriate training program to drive a culture of continuous improvement? How can you evaluate and enhance your training program to ensure continuity of expertise, and retain key employees? This session will cover the growing trend to bring full-fledged computing closer to users, creating a distributed computing function to deliver critical business services. Key discussion points include the need for mission critical resiliency at the edge and how the industry is responding to this need with new hybrid resiliency strategies. NOTE: We experienced audio issues during the Q&A portion of the presentation. We captured the questions and answered them in the PDF file available under "Attachments" tab when you start viewing the webinar recording. Whether it's blockchain and the cloud, or electric autonomous vehicles or IoT, more data centers are going to need ever more power at a time when electric grids are becoming less stable. Is this a fair view? What are the facts? We’ll look at the reality, timeframes, and potential courses of action led by Andy Lawrence, Executive Director of Uptime Institute Research with guest presenter, Professor Rabih Bashroush of University of East London. Modern businesses are being transformed into digital businesses. To do so, IT is being re-imagined to span hybrid infrastructures; including multiple data centers, co-location facilities and cloud service providers. This hybrid approach has many benefits including cost savings, but can increase the overall difficulty in supporting such environments to deliver a predictable level of IT services. We’ll discuss one methodology designed to assess your current risk profile and spot vulnerabilities. Are you adapting your infrastructure strategy to business, geopolitical and technology trends? Our panel of experts discuss the questions you must have the answers for along with trends that will impact your organization in the coming year. How will you adapt your strategic plan to climate change? What are the implications of new regulatory enforcement? How will your staff adapt to changing infrastructure deployment models? Will new workloads overwhelm your infrastructure plans? Change is here, so learn to adapt. In this webinar, Uptime Institute CTO Chris Brown, will cover facilities, IT preparation, communications, testing and more in relation to how to prepare your data center for the next major storm. 451 Research, Uptime Institute and a panel of industry experts have rated leading-edge technologies – including distributed resiliency, micro-modular embedded datacenters, silicon photonics, chiller-free datacenters, post-silicon devices, datacenter management-as-a-service and on-site microgrids – in terms of their ability to disrupt the business models, ecosystems and design of the datacenter. Rhonda Ascierto, Research Director, Datacenter Technologies and Eco-Efficient IT at 451 Research presents these 10 technologies and provides a "Disruptive Rating" of each as a measure of their potential impact on the data center market. This is a recording of a presentation at Uptime Institute's Executive Symposium: Las Vegas in 2017. The topic of the discussion was the causes and consequences of data center outages in 2017. The evolution of compute from single-site data centers to a multi-site hybrid computing model is enabling distributed models of resiliency that can achieve high availability and rapid recovery alongside improved performance. But there are also risks and limitations created by the complex software and coordination of new third-party services, as well as the technologies necessary to orchestrate applications and data. This session will discuss the pros and cons of four resilient architectures (traditional single-site, linked-site, distributed-site, cloud-based). This is a recording of a presentation at Uptime Institute's Executive Symposium: Las Vegas in 2017. Even in the best-designed and operated data centers, facilities can become vulnerable during highly stressful incidents. Uptime Institute CTO Chris Brown discusses how deploying a range of increasingly cost-effective monitoring to detect equipment failures before they happen can move the industry from fault tolerance (a reactive stance) to active fault avoidance.